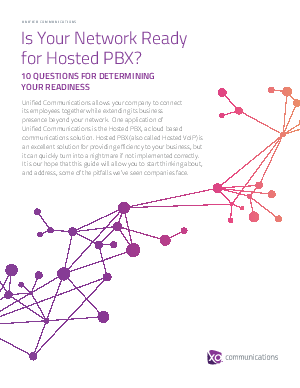 > XO Communications > Is Your Network Ready for Hosted PBX? Once you’ve decided to move your phone system to the cloud, it’s critical to ensure the solution can interoperate with YOUR existing infrastructure. When selecting a hosted VoIP service provider, make sure they are willing and able to work with you to determine your state of cloud readiness and help you prepare your network for hosted communications. This list of questions will give you examples of what a reputable provider may ask as they begin designing and provisioning your service. You will learn what’s essential for determining cloud readiness for a successful Hosted PBX implementation.